Classic Bond Forum • View topic - John P. Drake's personal fan art page. John P. Drake's personal fan art page. List of fan arts I've made, I hope you enjoy it. Alternate universe, featuring Michael Fassbender as the Classic James Bond. Alternate universe, again, featuring Jean Dujardin as the Classic James Bond, inspired from OSS 117: Cairo, Nest of Spies if anyone has seen it. A teaser artwork for my fan fiction starring James Bond and Lara Croft, entitled Hurricane Icestorm. And this is me as the Classic secret agent. And yes, I draw as well. I personally enjoyed doing this one, Lara Croft below and James Bond above: "Kneel Before Bond". L L! A theatrical poster for an alternate universe, the alternate BOND 21 in 2005, featuring Pierce Brosnan as James Bond. An alternate universe, once again, featuring Christian Bale as James Bond, the classic one. I believed that he could've been Bond, but The Dark Knight trilogy disappointed me like hell. Michael Fassbender, in his second outing, as the Classic James Bond. Alternate universe. Promotional Poster for my upcoming Grand Theft Auto: San Andreas mod, you can check out the thread in the gaming section. My very first novel's cover. And yes, Pierce Brosnan is James Bond in there, not anyone else. A parody I decided to make, James Bond being part of my favourite cartoon franchise, Looney Tunes. The long lost video game, the follow up video game to the legendary Nightfire, titled Phoenix Rising. I have a page to promote on Facebook for this, if you have Facebook accounts as well, please promote the page. Another version of a fan-made Phoenix Rising poster, featuring Agent Under Fire's Bond, based on Andrew Bicknell's likeness. More to come. Please leave a comment below. Last edited by John P. Drake on Tue Jul 16, 2013 8:08 pm, edited 1 time in total. Location: Somewhere, strangling Barbara Broccoli. Favorite Bond Movie: Dr. No, From Russia With Love, Goldfinger, Thunderball, The Spy Who Loved Me, Moonraker, For Your Eyes Only, The Living Daylights, GoldenEye, Tomorrow Never Dies. Favorite Movies: There are many to tell, but I prefer something that has a great storyline with loads of escapism and fantastic performance with over-the-top elements which would be pleasing. Action is the main genre I follow, and the spy genre would second that. Re: JackJamesBond007's personal fan art page. Pretty cool, I especially like the Phoenix Rising posters. 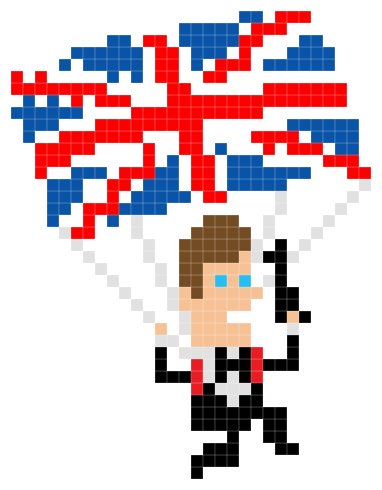 Have you drawn any Bond posters by hand, or do you just prefer to create them on the computer? The Saint 007 wrote: Pretty cool, I especially like the Phoenix Rising posters. Have you drawn any Bond posters by hand, or do you just prefer to create them on the computer? No, unfortunately I've drawn many *I hate to say this* Daniel Craig Bonds, thinking he would become a classic Bond with B23 but I was disappointed extremely. However, there is one drawing I've done that features Fassbender as Bond. I'm planning to make a Classic Bond gallery in the future. I'm also very glad that you liked those, I truly appreciate it. Thank you very much and Cheers. I do some Bond artwork myself, but being old-fashioned, I stick to the traditional art mediums. It's fun creating your own illustrated Bond artwork. Once again, great work. I look forward to seeing your other Bond pictures. It'd be interesting to see yours, as well. No doubt your artworks look fascinating. I would have to take my work to a copying shop to get scanned, since the images are fairly large. That's a pretty good Fassbender picture. Do you colour any of your drawings by hand? Sadly not. I just draw them by hand, scan them, then work on the outlines with Photoshop and colour them. So, it's a mixture of "traditional' and 'digital'. Most people now colour their artwork digitally, or just use pencil. I don't have any great computer programs for art, and I just prefer the traditional method anyway. It does take a little more time, and all the pencils/coloured pencils, pens, etc., can get costly. However, if you're skilled enough with blending and shading, you can do some pretty nice work with some of the less expensive brands of coloured pencils. I've never tried yet, but I think I will in the near future. And I have an ambitious dream to draw comic book sketches, as well, in Frank Miller-styled mould. I wish Frank Miller has done a couple of Bond flicks. 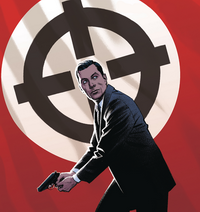 But, Mark Millar is doing something spy-related with The Secret Service, now. Some say it's good, some say it isn't. However, I haven't got the chance to take a look at them, yet. Good to hear that you're willing to try colouring by hand. You never know, you may even like it more than digital colouring. There are lots of people creating online comics now, so it's definitely something cool to get into. I bet. Well, I believe the true talent comes from the traditional methods, I'm someone, in spite of my age, prefer everything old school. So, I'd stick to the original traditions of everything. JackJamesBond007 wrote: I bet. Well, I believe the true talent comes from the traditional methods, I'm someone, in spite of my age, prefer everything old school. So, I'd stick to the original traditions of everything. I'll take it that you don't like 1998's Godzilla then. We have a godzilla right now, his name is Daniel Craig. LOL!! Nice work, Jack. I'm a fan of McGoohan's Danger Man and The Prisoner TV series. Have them both on DVD along with other classic spy series, which act as pretty decent Bond alternatives. The Saint 007 wrote: Nice work, Jack. I'm a fan of McGoohan's Danger Man and The Prisoner TV series. Have them both on DVD along with other classic spy series, which act as pretty decent Bond alternatives. Thanks, Saint007. I'm also a massive fan of Patrick McGoohan's Danger Man along with Ice Station Zebra he co-starred in with Rock Hudson. I have the DVDs, as well, and I agree with you about the alternative part. Re: John P. Drake's personal fan art page. What if Phillip Calvert 2 happened in 1973? This is my very first attempt of producing a comic book styled artwork after all these years, and I'm eager to see Pierce Brosnan in RED 3, teaming up with the old school action heroes in the world of espionage. So, the idea is, Nicolas Obstacle (Pierce Brosnan), MI6's top agent is hired to hunt down and terminate Victoria Winslow (Helen Mirren), his mentor and a former MI6 agent herself, on the purpose that she went rogue, much like the other RED members. In this story, Frank Moses (Bruce Willis) is out of the spotlight, but William Cooper (Karl Urban) and Han Cho-Bai (Byung-Hun Lee) appear in the story as Obstacle's allies, with the latter playing a Felix Leiter-type character. Eventually, Nicolas Obstacle joins forces with the RED team.